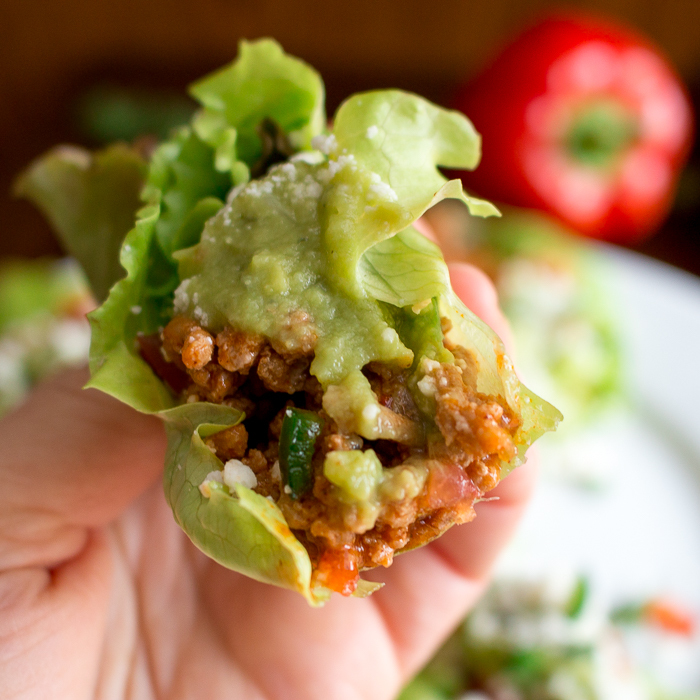 Turkey Taco Lettuce Wraps are deliciously crisp when you bite into them and then cheesy, zesty, creamy and crunchy- all wrapped up into one. It has all the flavors of the perfect taco without all the CARBS (carbohydrates). How many of you out there are watching their carbs, on keto diet or diabetic diet or just trying not to eat anything white? With the holidays fast approaching it can be difficult to stay on course but we are here to help you out with a few quick and easy low carb appetizers. Be sure to try our Baked Cheesy Salami Wrapped Jalapeños , Asian Beef Roll Ups and our Traditional Baba Ghanoush with crispy vegetables to dip for some other low carb appetizers to try. Whether you are hosting a gathering or need to bring a starter to pass you are going to be ready to go. 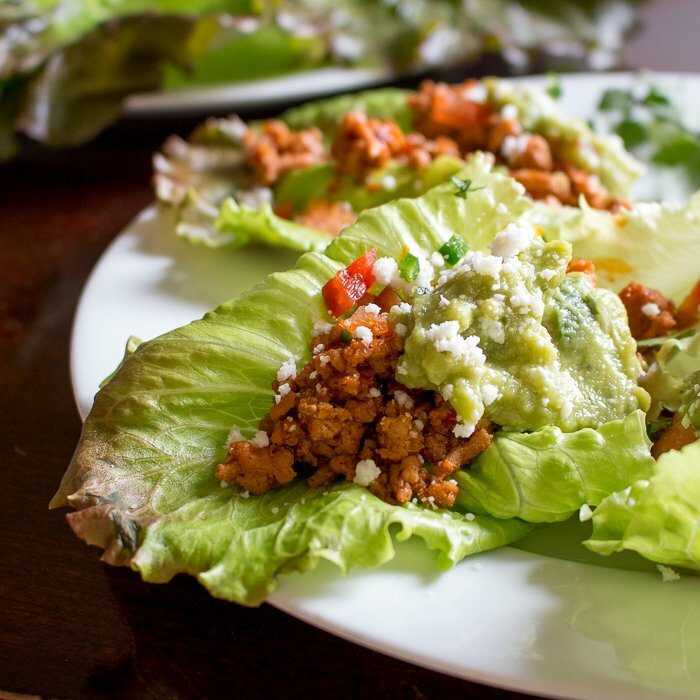 Turkey Taco Lettuce Wraps takes less than 30 minutes to throw together. You could even brown the ground turkey and prepare all the topping in advance for a quick throw together just before your guests arrive. Are you aware that usually the first ingredient on a taco seasoning mix is DEXTROSE? Yep, you heard me right DEXTROSE= SUGAR is the very first ingredient. If you are diabetic or on a keto diet those pre-mixed taco seasoning mixes are off limits to you. However, it is super simple to make your own taco seasoning mix with a few spices from your pantry. Check out our recipe below for details. Sometimes you can go from feeling full to famished in nanoseconds…. And you want something quick that sticks to your ribs kind of meal or high powered snack. 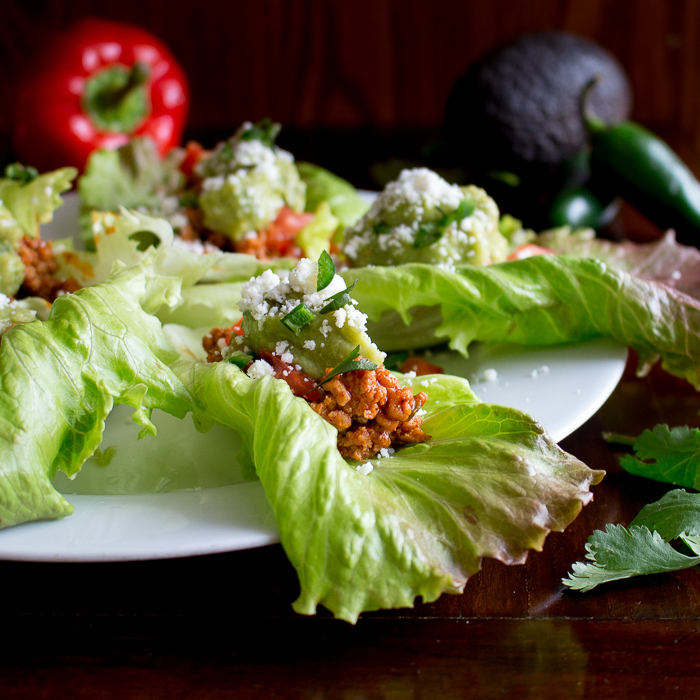 Learning how to make Turkey Taco Lettuce wraps is a great tool to have in your back pocket for just these occasions. 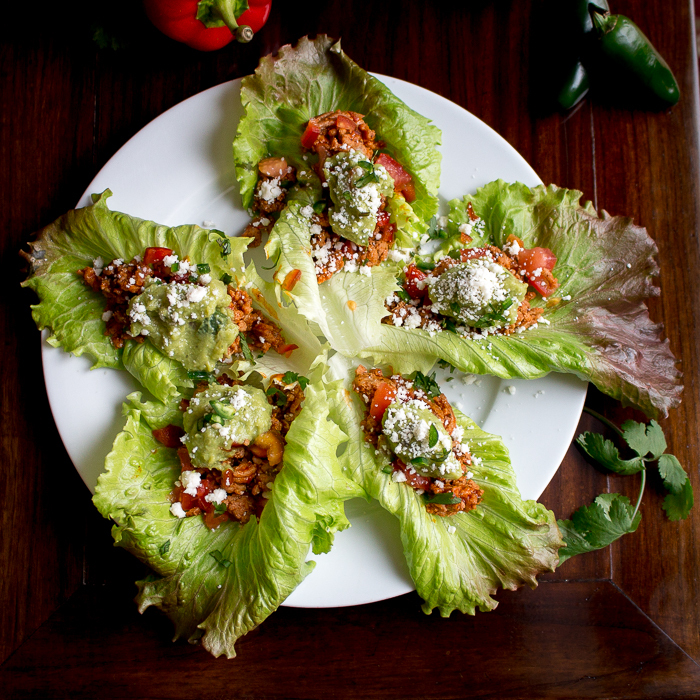 Turkey Taco Lettuce Wraps are perfect for pre-game or tailgating for your next sporting function. Fun to eat and full of flavor and you can make them with any toppings your little heart desires. We made ours with ground turkey just for a leaner protein and topped with a little guacamole, cotija cheese, jalapeno and red bell peppers, tomatoes and cilantro. We used red leaf lettuce fresh from the last of the Farmer’s markets but also delicious with romaine or iceberg lettuce too. 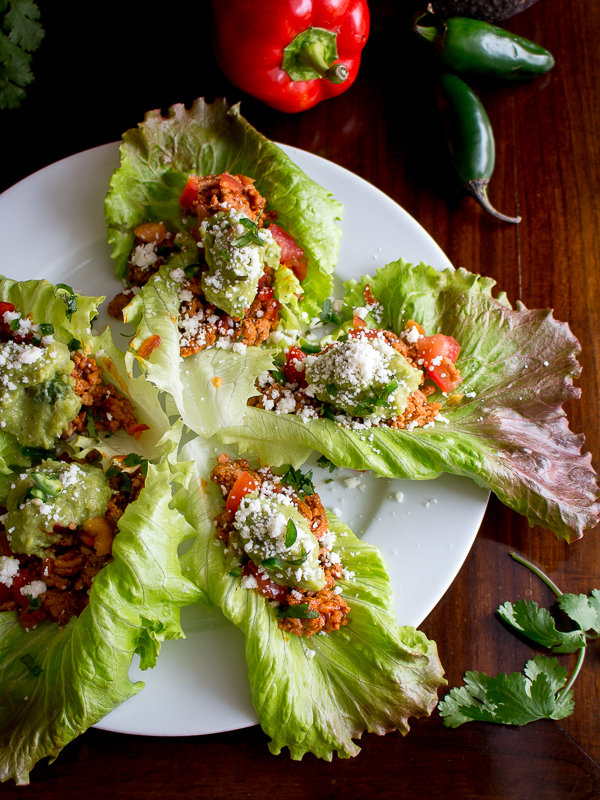 Turkey Taco Lettuce Wraps are also very fun party food. You just put out the fresh lettuce leaves and all the toppings and let everyone make their own just they want they want it. Perfect for the picky eaters in the group. We made a quick guacamole from scratch which consisted of mashing 2 ripe avocados, lime, tomato, salt and mixing well. If you are feeling lazy just slice some avocado on top. 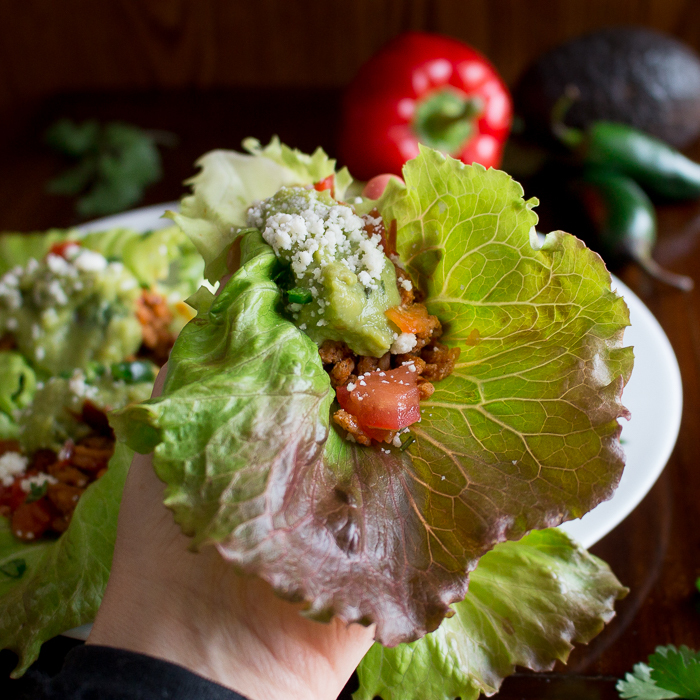 Avocados are delicious and perfect on this low carb lettuce wrap. Avocados are a nutritive super food full of minerals and vitamins and fiber. Did you know that avocados are a fruit? Super creamy and delicious and make you feel fuller longer and more satisfied due their healthy fats. We made enough for a hungry tailgating crew but you can just cut the recipe in half if just a couple of you. Lettuce leaves – 18 (we used red leaf lettuce but can use romaine or iceberg, etc) washed cleaned and dry. 1Add oil in skillet and brown your ground turkey. Add the Taco seasonings (chili powder, cumin, garlic powder, onion powder, oregano, paprika, salt and cayenne pepper) Add water and mix well. Set aside and keep warm. 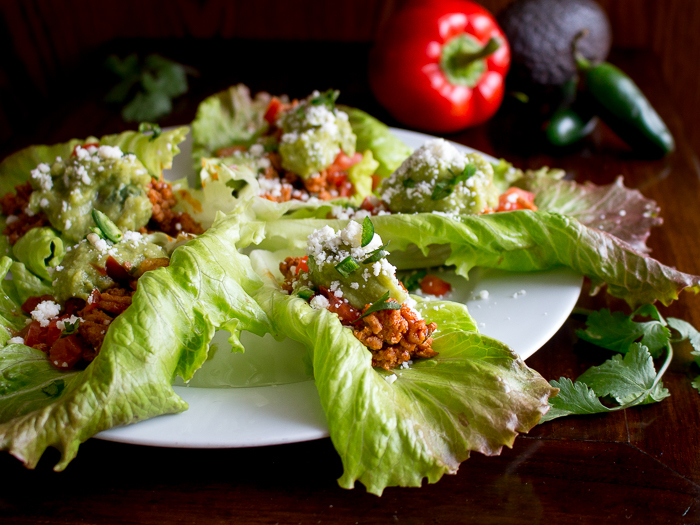 2Lay out your clean and dry lettuce leaves and top with warm ground taco turkey and any topping you desire. We topped with freshly made guacamole, tomato, cheese, red bell pepper, jalapeno and coriander.